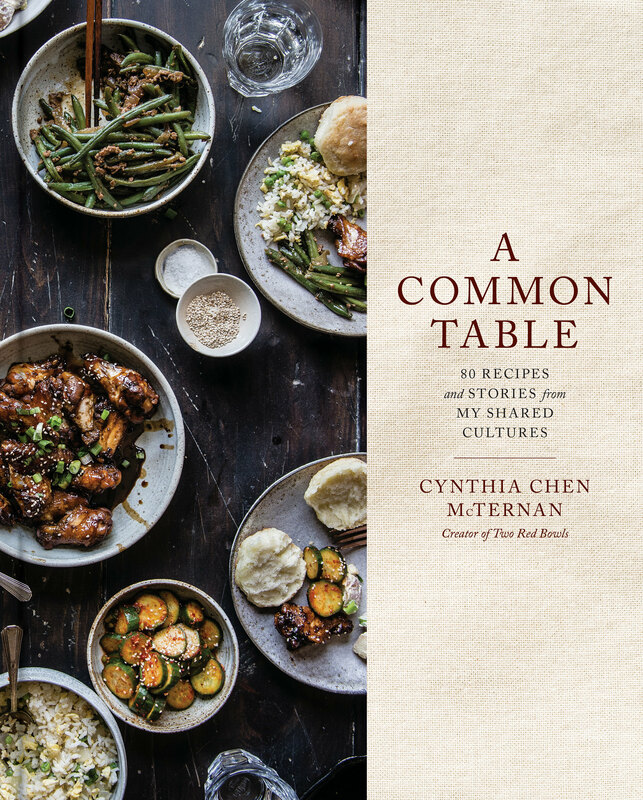 I feel like there are a few recipes that every blog should have. Just basics, like a solid mac & cheese, or a good homemade pasta sauce. There have been some that I’ve checked off my list — a go-to buttermilk pancake base, and a classic chocolate chip cookie. 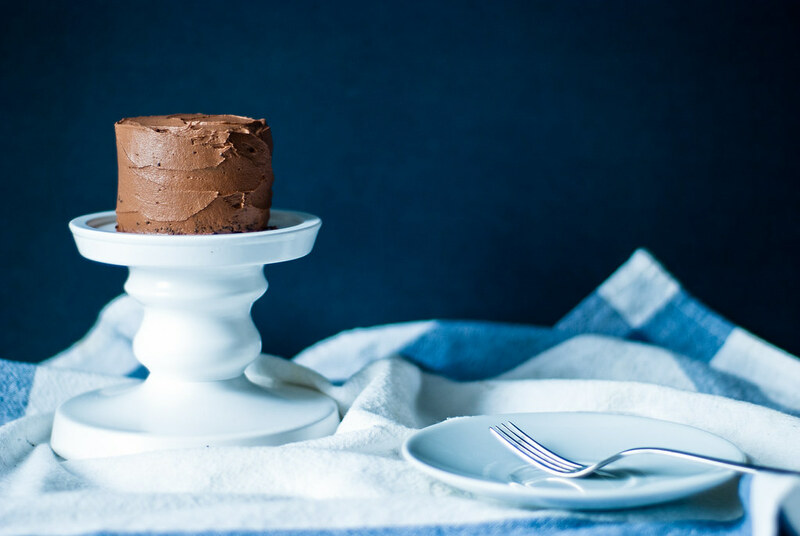 But one that I’ve been meaning to get around to (you know, in addition to the mac & cheese and the pasta sauce) is just a simple, classic chocolate cake, and a good chocolate buttercream to go with it. 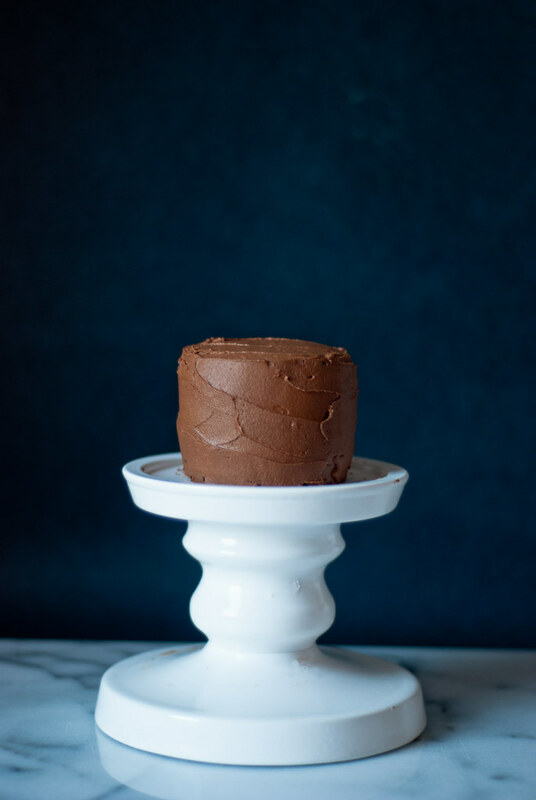 For awhile I couldn’t decide on a recipe to try, partly because I didn’t want to be saddled with a gigantic chocolate cake to get through between just the two of us (much less a mediocre gigantic cake, if it didn’t turn out well). Then I got the idea to try and make a mini chocolate cake out of “layers” made in four-ounce ramekins. 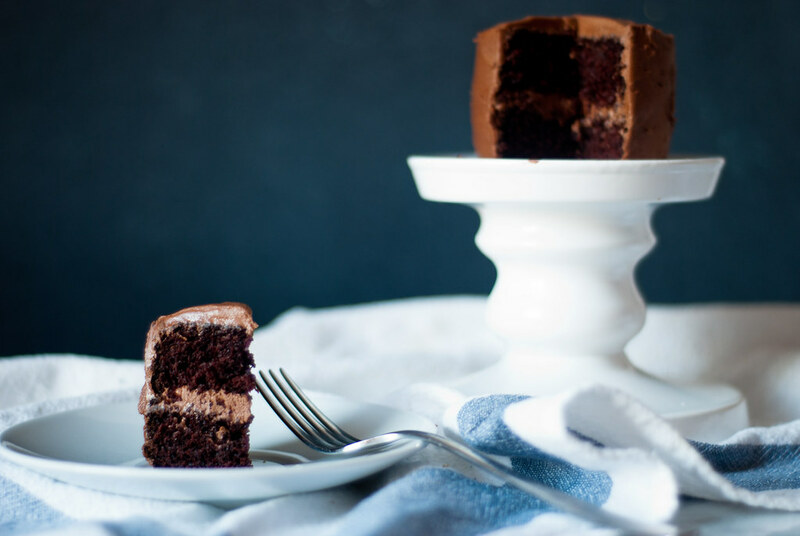 But most classic chocolate cake recipes (this one looks unbelievable) use just a few eggs for a large cake, so that the recipe can’t be scaled down as easily (or else you end up using less than an egg, which, let’s face it, no one likes to do). Finally, I came across this hilariously-named chocolate cake that uses no eggs, just vinegar — and discovered that vinegar-only chocolate cake is pretty common (usually with an equally funny name). I fiddled with the numbers a bit, added some brown sugar and coffee (always coffee in chocolate baking! Trust) and came out with this. 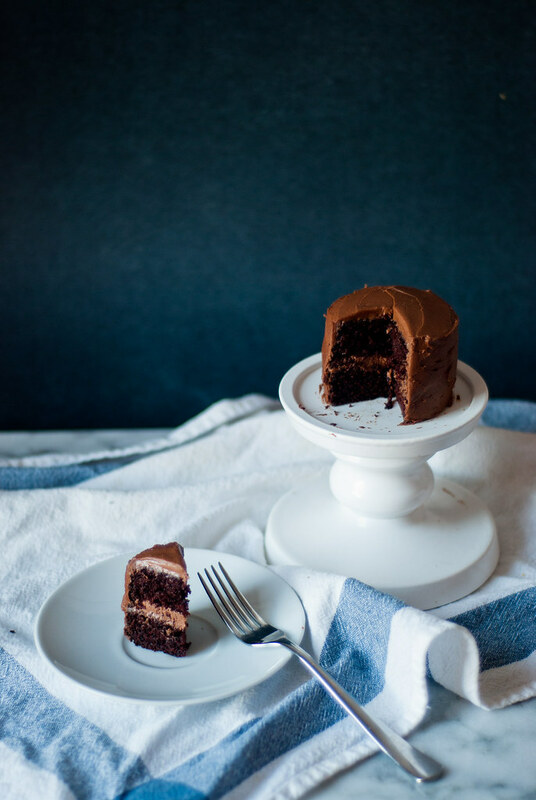 I thought it was perfect — nice and moist, with a wonderful, deep chocolate taste. I used balsamic vinegar because it was all I had on hand and was a little nervous about it, but it added just a touch of nuance, and not in an unpleasant way at all. Evidently it’s a thing! 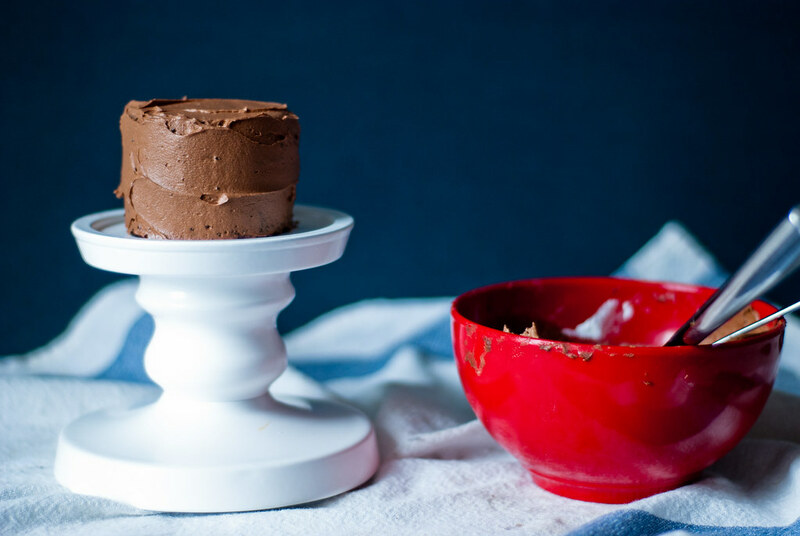 I was just thrilled — this cake is so easy, manageable, perfect for two (and vegan!) without scrimping on taste. The buttercream is definitely not vegan, but equally delicious. I could never understand eating frosting on its own before I started making my own. But this, and a maple brown butter cream cheese frosting I just made from Tutti Dolci, and lime cream cheese frosting I made the other day — oh man, my life has been changed. 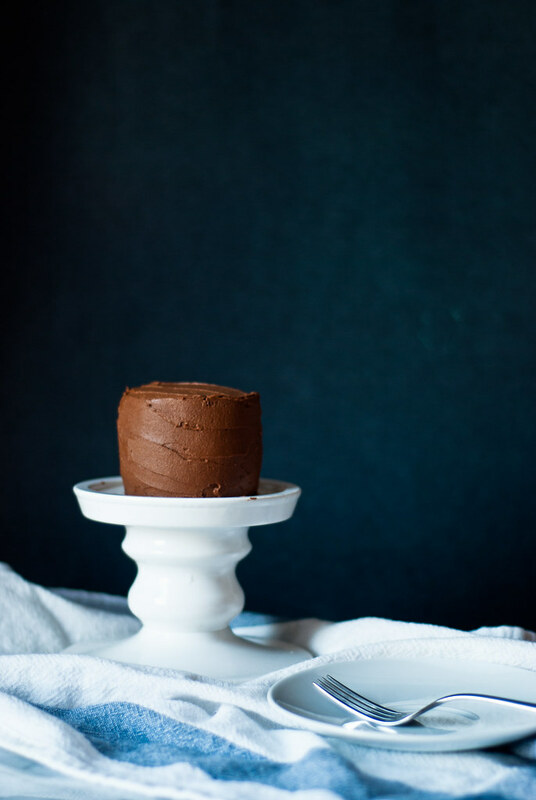 The recipe below makes exactly enough for this mini cake, but you may want to double it so that you’re not nervous that you’re eating too much for the cake. Or so that you can sit on the couch and eat it straight with a spoon later instead of eating lunch. Not speaking from experience at all. 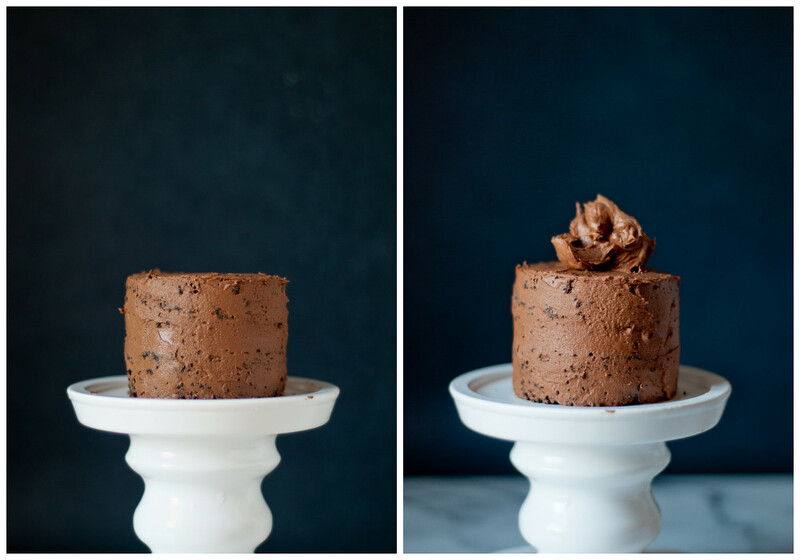 Lastly, a quick run-down of how I made the layer cake mini. I lined two four-ounce porcelain ramekins (six-ounce would work fine, as well) with parchment paper circles, divided the batter evenly between the two of them, and baked on the middle rack. Once cooled, I leveled them with a knife (probably not exact, but eh!). I placed one layer, bottom side down and leveled-side up, on the mini cake stand (secret: actually this candle holder from IKEA), and frosted the top. Then the second layer I placed upside down, or leveled-side down, then did a crumb coat. One nice thing about mini cakes is that you don’t need a revolving stand to frost the sides — they’re so small that you can just hold the stand and revolve it as you go. After the crumb coat, I chilled it for about 20 minutes to set the frosting. Then I put the final layer of frosting on and, done. If you’re looking for a real tutorial, I followed a great one by i am baker, here. Some tips I didn’t find necessary for a mini, like chilling the cake before working with it, but I found chilling the cake after the crumb coat was particularly helpful. I also used Jennifer’s tip (from Savory Simple, most beautifully-done cakes you’ve ever seen!) on heating the knife before cutting slices for a clean cut. 1. Preheat the oven to 350F. Line two 4-ounce ramekins with circles of parchment paper. 2. 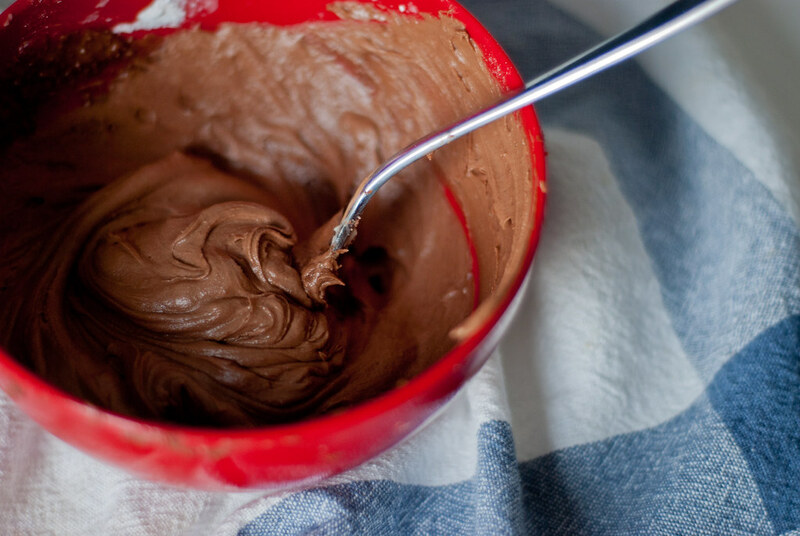 In a medium bowl, whisk together flour, white sugar, cocoa powder, baking soda and salt. In another bowl, whisk together brown sugar, vanilla extract, vinegar, oil, and coffee. Combine wet ingredients with dry and whisk gently until smooth. Divide evenly into ramekins. 3. Bake for 13-15 minutes, or until a toothpick inserted into the center comes out clean. 4. Cool in pans on wire racks for 15 minutes. Run a knife around the edges of the ramekins, then flip ramekins. The cakes should slide out easily. Peel the parchment paper off (which should also come off like a dream, even if not greased) and then flip them back right-side up to let the cakes cool completely. 5. If storing overnight before frosting (they can be made a day ahead), just wrap completely in plastic wrap and keep at room temperature. 1. Whisk butter in a bowl until very smooth. Sift together the sugar, cocoa powder, and salt, then add to the butter in two batches, whisking after each addition. 2. Mix until the sugar and cocoa powder are absorbed by the butter, then add vanilla and milk and mix again until fully incorporated. 3. If your frosting needs to be stiffer, add a little more sugar. If it is too stiff to spread, add milk a few drops at a time. 1. Level the cake tops if there is a dome. 2. 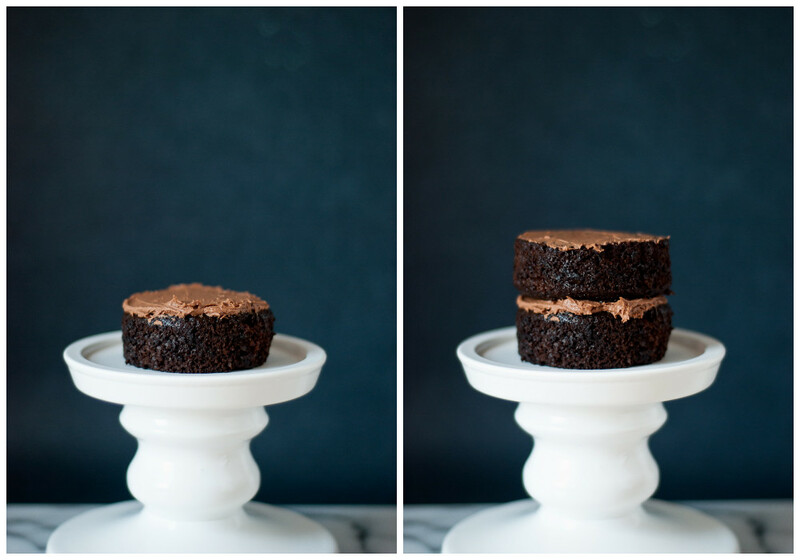 Place one layer, leveled-side up, on the cake stand. 3. Add an even layer of frosting to the top, then place the second layer, leveled-side down, on top. If you have more layers, repeat this step again until you run out of cake. 4. Do a crumb coat — a very thin layer of frosting to seal in the crumbs — over the entire cake, then chill the cake in the fridge for 20 minutes or so. 5. Frost again with a final, thicker layer of frosting. Done! When serving, for a clean cut, run a very sharp knife under hot water, wipe dry, and then cut the cake while the knife is still hot. Cut downwards in one motion, then slide the blade out towards you, not up. It is too early in the morning to want cake, and yet I do. Oh man, I can taste the buttercream. I could practically smell it as I was editing these photos! Seriously good. I will not judge if you eat it for breakfast. Ahhh, thank you so much for coming to my little blog to comment! I’m so flattered, especially coming from you — I adore your blog. 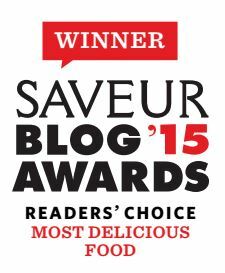 Thank you for your delicious recipe — it’s my favorite cream cheese frosting now. I brought the pumpkin bars into the office and the frosting got tons of compliments. Bookmarked as a go-to in the future, for sure! Why am I just hearing about vinegar cake now!? And even better, a balsamic vinegar cake!? Off to waste time googling! But not before I let you know that this cake is pretty dang cute. Especially on that cake/candle/sh! stand! A whole cake is always way too much for just my husband and I to eat, so this would be perfect to whip up for a small special occasion. I’ve read about using vinegar (which would react nicely with soda) in cakes and it has always put me off. Balsamic, as it’s only a splash, probably wouldn’t bother me. Funny thing is, love vinegars in dressings and chips (French fries). But can’t stand it in cooking. Well, chutneys are different. I feel you, I was nervous about it! I’d previously used apple cider vinegar in a few of Isa Chandra Moskowitz and Terry Romero’s recipes from Vegan Cupcakes Take Over the World, which I thought was nice and mild, but never balsamic, and that did have a slightly stronger taste. I’ve actually seen some cake recipes call for white vinegar, though, and that I don’t think I could ever bring myself to do! Haha, yes! Mini-desserts are my choice of poison 🙂 But I like your strategy too! For some things (especially yeast baking) I like to make a large batch and freeze it (so that it’s not easily accessible… haha) and bake up a few at a time. Out of sight, out of mind! HAHA Nancy!! I am the EXACT same way. I’m like oh, VEGAN? Well then obviously it must be like. Negative calories. Logically. And I’m obsessed with all things mini, so I love any excuse to make things into mini format 😉 Thanks so much for the compliments — I thought this was kind of frustrating to photograph so I’m glad it seemed like it worked out! Looks amazing and that you used the candle holder: so smart! Beautiful photos! 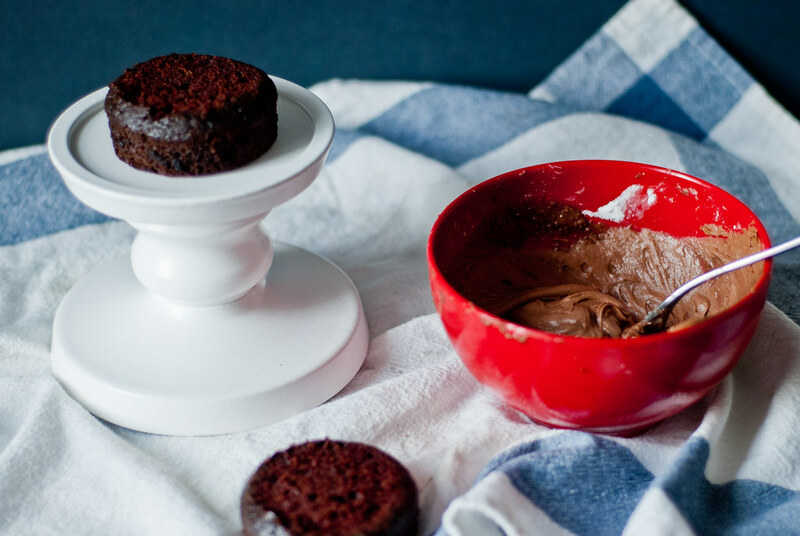 I love your improvised tiny cake stand. I did not know that I needed a mini cake recipe until just now! So, thank you! I will try this with gluten free flours and see if the chemistry still works! Oh, I’d be so excited to hear your results! Baking chemistry fascinates me, especially when you get into the different kinds of flours. 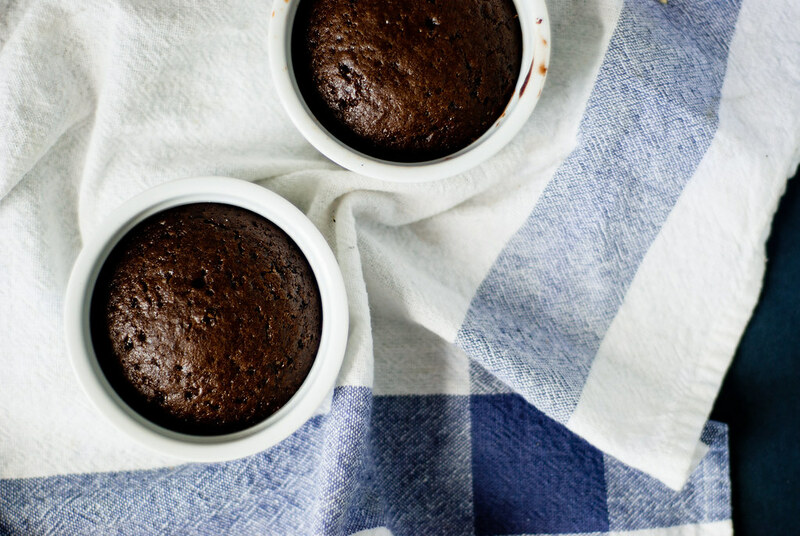 And the best part of experimenting with mini cakes is, too, that it’s so low risk — only 1/4 cup of flour at stake! Hope it turns out well for you! 🙂 Thank you so much for your kind words! i dont know y but my cake just didnt come up it just collapsed from the centre and went all gueee the recipe didnt work for me any idea ………… y? Hi Hetal, I’m so sorry to hear that!! Do you mean that it didn’t rise at all while baking, or that it rose and then collapsed when it came out of the oven? If it rose and collapsed, then it may have been any of several things .. first, make sure your baking soda hasn’t expired. Second, oven temperatures can sometimes affect whether a cake rises properly. Third, I’ve found that when I take the cake out a bit too early, the center hasn’t finished baking, and that can cause it to collapse. And finally, that also happens when I’ve added too much liquid to the batter. I hope that helps! Cake looks good! As a vegan I’ll just forgo the buttercream, no trying to veganise that!